The night before Thanksgiving, I cooked a batch of rolls using a recipe from a paperback Betty Crocker cookbook we’ve had for years but seldom cook out of. 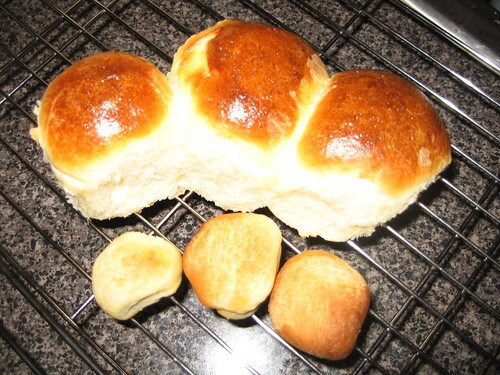 It seemed a quick, easy recipe for simple dinner rolls. The bread book I typically use (The Breadbaker’s Apprentice) is more of an artisan bread cookbook. The breads it provides formulas for are yummy, but they tend to be a multi-day pain to actually make. I don’t know what I did wrong, but my rolls would not rise. After much longer than it should have taken (and with all sorts of coaxing), they nearly doubled in size, so I popped them in the oven and crossed my fingers they’d do the rest of their rising in there. They did not. They tasted more or less ok, but they were small and hard and ugly. Yesterday, hankering for some rolls for turkey sandwiches, I decided to try the fancy cookbook recipe for white bread rolls. I’ve used one of the three very similar formulas for white bread to make loaves, and they didn’t turn out as wonderfully as expected (they were fine sandwhich loaves but not the kind of bread you go out of your way to eat for its own sake, like the brioche). But confronted with the small hard ugly rolls or a perfectly servicable but not outstanding white bread roll, I opted for a do-over. And the results, as you can see from the picture, were rather better. The second batch looks great! So when are you starting your artisan bakery? It is possible that you killed the yeast with the first batch. I’ve done it. If something got to hot (where you couldn’t touch it with your hand) the yeast just don’t survive. Not enough kneading can do it too. But, depending on the bag of flour, it is possible that there was not enough gluten. Or, perhaps, just a bum recipe. So when did you say you were serving those turkey sandwiches?